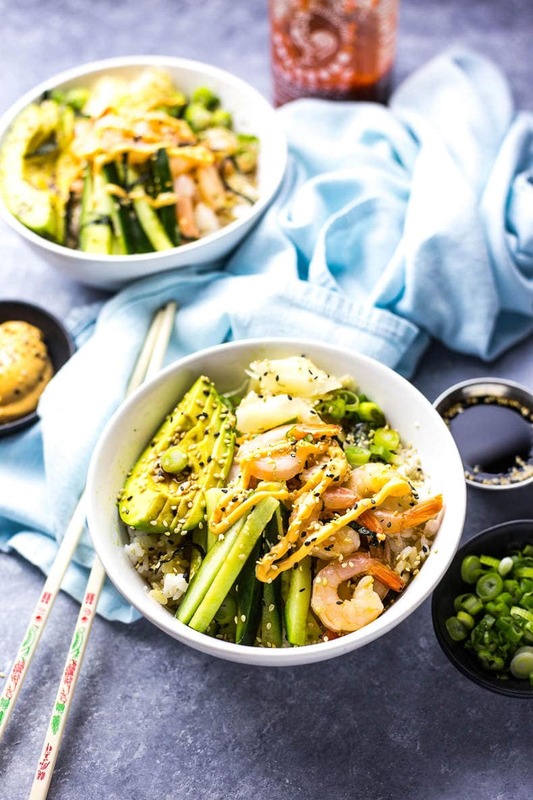 These Shrimp Dynamite Sushi Bowls with pickled ginger are a healthy 20-minute dinner idea that's a play on your favourite sushi roll – no special tools or skills required! Sushi is one of those things I can make at home, but it's usually far more complicated and tricky than just heading to your fave takeout place or the grocery store and picking up some rolls. 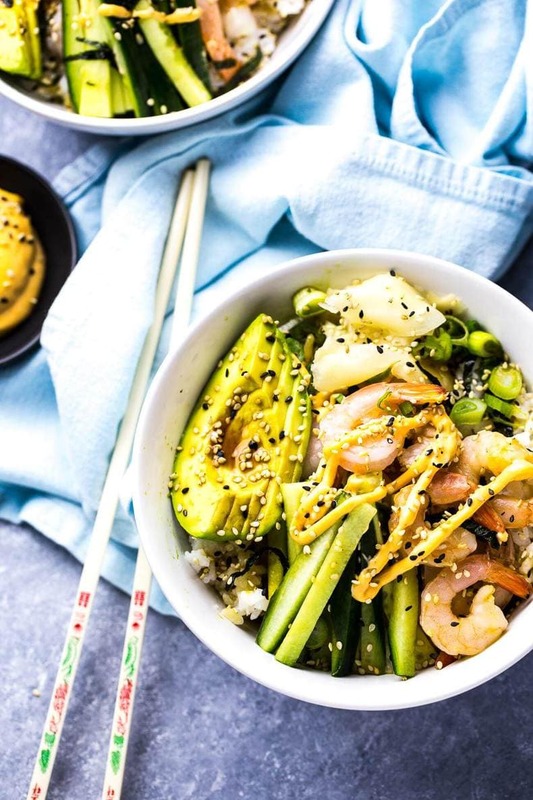 Both options are usually expensive: you have to buy a fresh set of those rolling mats, a whole bunch of nori, wasabi, fresh seafood and all kinds of toppings that you have to cut up in a special way. Then the sushi rice can be finicky and hard to stretch out over the nori, and it takes a certain level of finesse to actually roll and cut the sushi. By that time, you're probably wondering why you didn't just spend the $8 on your fave roll, am I right? Well, I have some good news: Dynamite Sushi Bowls are waaaaaaayyyyy easier to make than the rolls themselves, and still taste pretty delicious. I mean, I'm no stranger to sushi bowls. 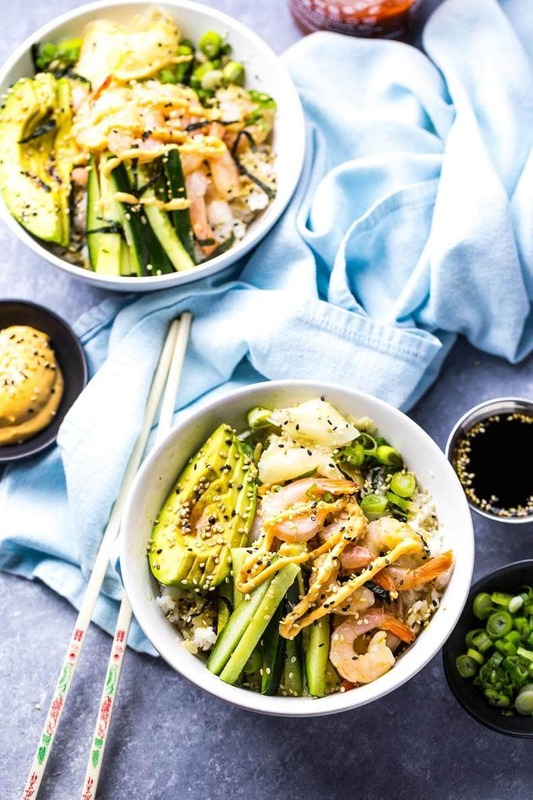 But this play on my favourite sushi roll is gonna blow your mind, so if you've only got 20 minutes to make dinner AND you're craving sushi, then this is the recipe for you! 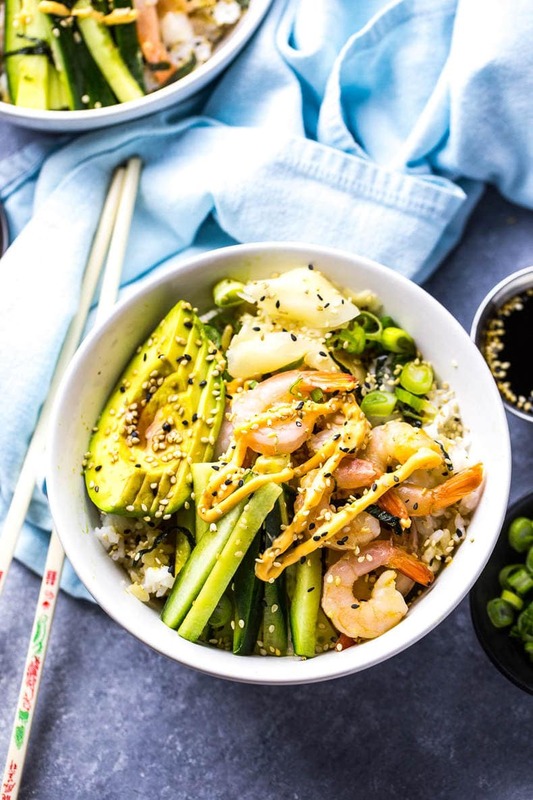 Just dump the rice in the bowl, top with some of your fave sushi toppings (heck, you could even do a California roll bowl if you really want!) and drizzle ALL of the spicy mayo and soy sauce. OMG. Dying. I have a special appreciation for Dynamite Sushi Rolls because I am obsessed with shrimp. Long before I started exploring the world of seafood as my tastebuds matured (I used to really hate ALL kinds of fish and seafood), I loved shrimp. Maybe it's because it's the most mildest tasting seafood, or maybe it's because of all the shrimp rings my grandma used to buy for family parties. Either way, I still have a special appreciation for this shellfish and so when I first moved to Toronto, California rolls and Dynamite rolls were all I would order. In my last year of university, I embarked on a really crazy adventure working construction in Alberta and Manitoba for a summer (I know, I've worn many hats over the years hehe). Now some of the towns where my crew and I worked were in the middle of nowhere. Like, drive out to one of the most remote areas near where you live, and then drive 6 hours north. That's the kind of rural, isolated areas I'm talking about. One of the towns we stayed in was on the edge of an Aboriginal reserve, and basically had a motel with a bar inside it, one restaurant (that served the most amazing crinkle cut fries poutine btw…maybe I was just desperate for trashy comfort food though?) and two gas stations, one of which actually sold DYNAMITE SUSHI ROLLS. Imagine my amazement as I'm more than 6 hours north of Winnipeg, Manitoba in the middle of nowhere, driving on dirt roads thanking my lucky stars I bought three weeks' worth of groceries before the trip up and then out of all things, a gas station not only has packaged sushi, but specialty DYNAMITE ROLLS. My mind was honestly blown. A little piece of home can go a long way when you're feeling homesick, even if that comes in the form of your favourite sushi roll. Almost four years later I still dream about eating those Dynamite sushi rolls in my work truck during my breaks, eating a roll in every now and then while driving. Which I would say is dangerous except I was leading traffic through the construction zone at about 20km per hour and stopping every now and then to let cars through. But anyways, the ironic part of all of this is that I don't even eat nearly as many Dynamite rolls anymore because a) I rarely ever go out for sushi because it's so expensive and b) I don't really care for the breading on the shrimp in most rolls anymore. 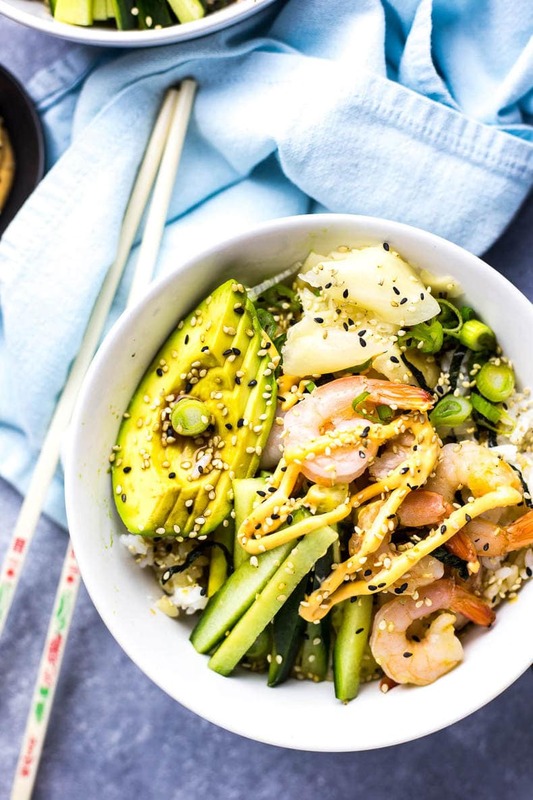 So the only solution really, like I've been saying all this time, is to make these Dynamite Sushi Bowls instead. Healthy, ready in 20 minutes and absolutely to die for. No complications, and definitely easier to eat with just a fork. And if you're really feeling adventurous, I recommend that you go out and buy some seaweed salad to add to these bowls. 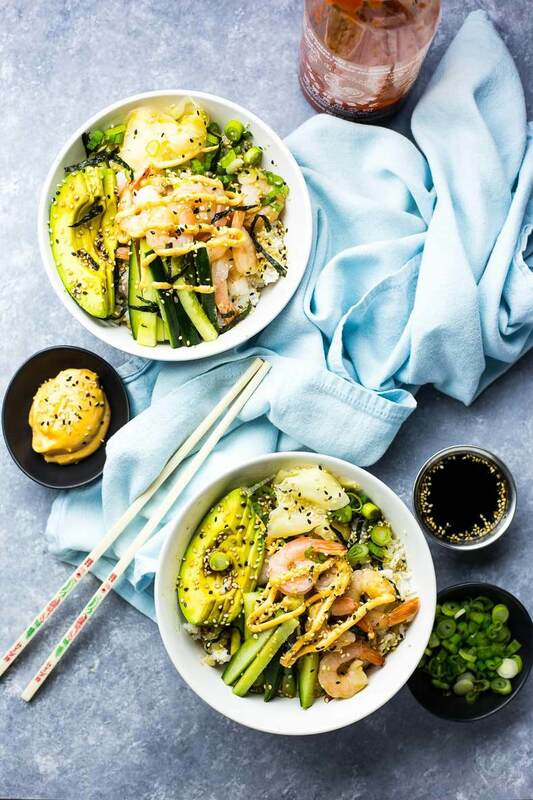 That is another recent obsession of mine – the umami flavours pair so nicely with the sushi rice and different textures of the smooth avocado slices and crunchy cucumbers. I just can't get enough of these bowls. Hello king of all grain bowls. Or buddha bowls. Whatever you wanna call these bowls. 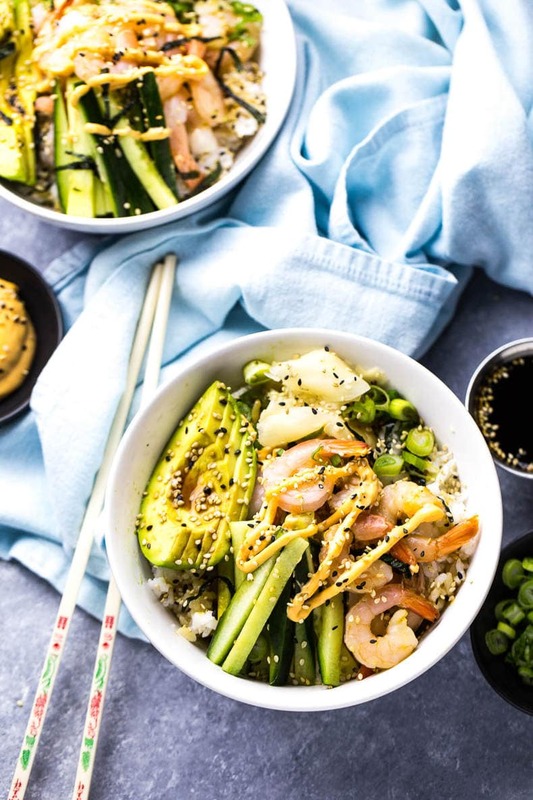 Will you be making these Shrimp Dynamite Sushi Bowls? What are your favourite sushi rolls? I guarantee you can transform any of your favourite rolls into bowl form with my basic formula below! 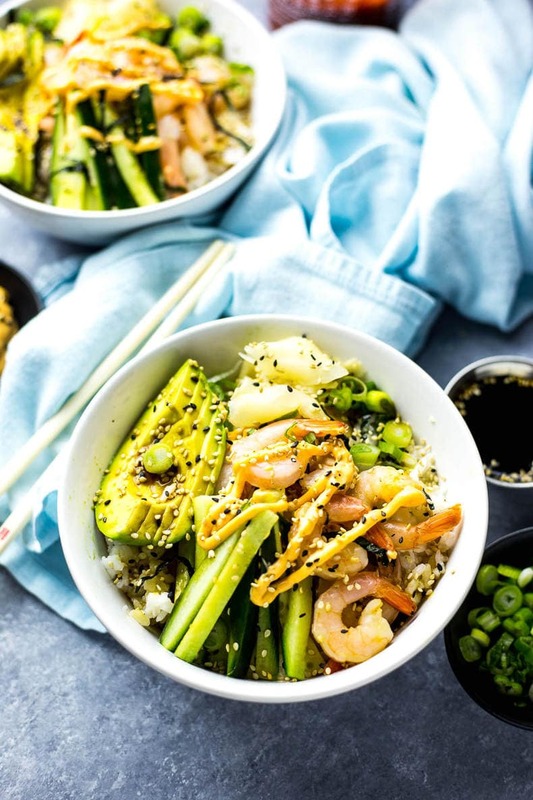 These Shrimp Dynamite Sushi Bowls with pickled ginger are a healthy 20-minute dinner idea that's a play on your favourite sushi roll - no special tools or skills required! Meanwhile, prepare ingredients so all you have to do is assemble your bowls once the sushi rice is done cooking. Mix sriracha and mayo together to make spicy mayo then spoon into a plastic bag and cut a tiny hole at the bottom for drizzling. Once sushi rice is done cooking, mix it with rice vinegar and sugar, stirring well to combine. 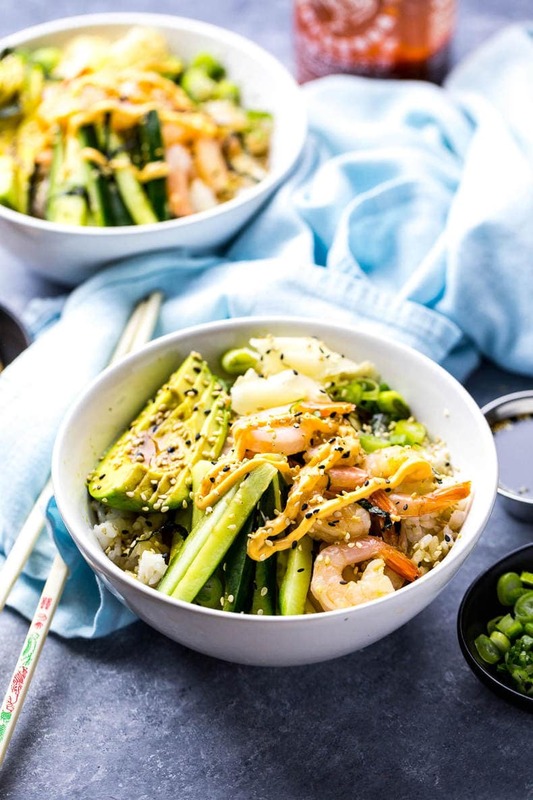 Add 1/2 cup rice to each bowl and sprinkle with sesame seeds, then add 1/4 package of shrimp, some cucumber, 1/2 of each avocado, pickled ginger, nori and scallions. Pour soy sauce overtop to taste, and garnish with more sesame seeds. Drizzle a bit of spicy mayo overtop and serve! You know, I’ve always been pretty skeptical about these type of bowl meals. They usually seem overly fussy to me, but this one does pique my interest! I totally agree with you about not messing around making sushi at home unless it’s like a special evening project or something. Making sushi this way is totally doable and practical. And it looks seriously delicious! That avocado and spicy mayo especially!! Wow and wow again! This was really something else. All the taste and texture with none of the fussy and frustrating construction. The only thing I did different was drizzle just a touch of sesame oil over the dish as I didn’t have the seeds. So so good. Thanks for a wonderful recipe.